The author of this article has a deep interest in dog's since his childhood and kept them as pets always. 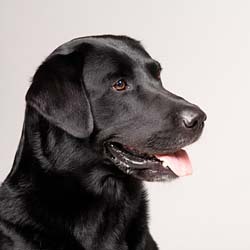 He purchased a black Labrador pup in 1976, from Col. R. N.Sen of Dehradun (India), who was a reputed breeder of Labradors and Golden Retrievers. The pup's name was "Black Jasper". The author was 20 yrs. old at that time and had no professional experience of dog-handling, training or big dog-shows. The "Black Jasper" won several prizes and honours in various national level dog shows and the author was proud of owning it as a pet because it brought him immense recognition and fame among dogs owning community of that time. However, author always wondered, why this particular dog brought him so much honours? He has kept two more dogs earlier. But such glamour phenomenon has never occurred before. Was it happening by chance only this time? The answer came after 30 long years. With the passage of time, author became a Vedic astrologer by profession and he did some original researches in Vedic numerology. Black Jasper has gone long ago but all of it's documents, certificates and photographs were still available in the records-room. Author brought-out dog's file and studied various documents carefully, in the light of his recent researches on Vedic numerology. Results were really "Stunning". Vedic numerology has provided the author conclusive answer to his thirty year old query - Why it was so? Was it by chance only? No, it can not be a case of "By chance" !! The secret was hidden in the dog owner's Vedic birth-chart. The Chaldean root numbers of dog's name, breeder's name, registration number, transfer number, judge's names, dog-show venues, exhibit numbers etc. etc. - all were the dog owner's best lucky numbers. It was happening not only once but again and again. It can not be "By Chance" all the times. We have prepared detailed web-pages for various related events in the life of Black Jasper, with documentary proofs.